After 26-year reign, pontiff dies at 84 - Roman Catholics all over the world gather to mourn. Pope John Paul II was remembered Saturday as a "champion of human freedom," a "tireless advocate of peace" and a man with a "wonderful sense of humor" who was easy to talk to. The charismatic pontiff, who led the world's 1 billion Catholics for 26 years, died at 9:37 p.m. Saturday (2:37 p.m. ET) in his private apartment, the Vatican reported. He was 84. The Plovdiv Mayor, Dr Chomakov sent a condolence telgram to the Vatican, pointing out the fact that Pope John Paul II was a unique spiritual leader, who entered a Synagogue as well as a Mosque... 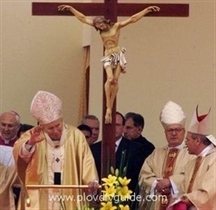 He visited Bulgaria in 2002 and blessed all the nation. Plovdiv will always remeber his visit to our city.